Set static sequence, practiced in a hot room 36-38C. Vinyasa means "breath-synchronised movement", which flows between each posture, connecting them together and creating a flowing style that can be practiced at different levels: from beginners to advanced. dynamic vinyasa flow in 38-42 degrees. changes weekly. 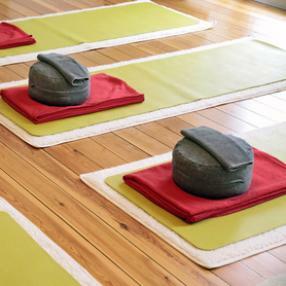 A dynamic, power flow class in a heated room of up to 32 degrees. A Vinyasa Flow class practised in a room heated with far infrared panels to 35 degrees. A challenging class for more experienced practitioners that assumes a good grounding in the principles of asana and breathing. The 37 degree heat and immersive ambience will melt you deeper into your practice, whilst being carefully and personally guided through a flow of postures that will open your body, work your heart and calm your mind in equal measure. Suitable for all levels, refreshing and impactful classes that are grounded firmly in reality and relevance to today's lifestyle.